This is actually a photo that was taken a couple of weeks ago. Winter Park Ski Resort, on Christmas Eve, has a torchlight parade where skiers go down the mountain with lights, followed by Santa and then some fireworks (and then some lit snow machines too). We didn't go last year because it was about 2 degrees outside, but this particular evening was somewhere in the 20's, so figured it would be fun. A huge bonfire was lit in the middle of the main ski area with people milling around, and holiday music blaring over the loudspeaker. Leif lifted Peter up on his shoulders so he could see the skiers coming down the mountain, and also see the fireworks. This is more of a social event than anything - it's fun to people watch, and just be outside with everybody. I was playing with settings on the camera continuously, and took way too many fireworks shots. Everything had tons of noise in it (based upon where I was standing and the darkness of the area), but I actually like this one. 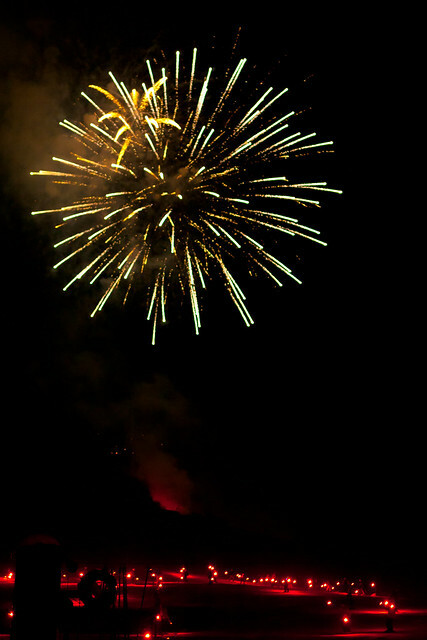 Leif suggested I get rid of the smoke, but I like it in the shot since it's part of the fireworks.